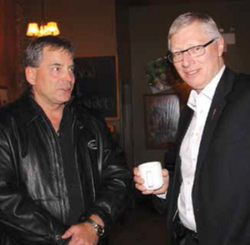 Residents of Wetaskiwin and region were invited to join the Hon. Verlyn Olson, Minister of Agriculture and Rural Development, and his wife Mardell Olson for a New Year’s Open House in Wetaskiwin on Wednesday, January 7th, 2015. But as the Minister and his wife moved about in Huckleberry’s Café sharing best wishes for 2015, the Hon. Minister Olson and his wife quickly became greeted as “Verlyn and Mardell”. In a brief and unplanned address at the beginning of the evening, Minister Olson was quite candid about chaotic times they were undergoing in the Legislature with low oil prices and economic uncertainty, leadership changes, Cabinet shuffles, by-elections, some controversial legislation and of course, the floor crossings. He did nevertheless, assure the guests that however distracting the chaotic times were, in the midst of it all the focus remained on Constituency and Ministerial responsibilities. The Olsons hosted a similar event at the Jeanne and Peter Lougheed Performing Arts Centre in Camrose the following eventing. Pictured: Hon. Verlyn Olson shared many conversations with guests like Steve Ambrose at his Open House, January 7th, 2015. Photo by Barry McDonald.